Everything is fair in love and war, and this is love with war. 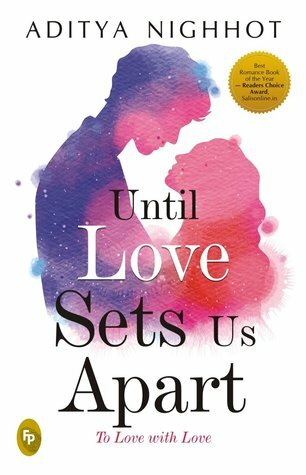 Until love sets us apart by Aditya Nighhot is a romantic fiction. This story is inspired by real-life incidents. This is Aditya's second book. The plot of the story based on friendship and love. The main characters are Aisha and Rohit. Rohit had a muscular body, straight hair, six feet tall. He looked like a model. Aisha had fair skin and blue eyes. She is from Delhi while Rohit is from Pune. They pursue M.B.B.S from Bharat Medical College. They both met first at college. Rohit is a stud and carefree. He never takes studies seriously. Aisha is the complete opposite. She is studious and sincere. Apart from these two, there are Alok, a small town boy. Neha, a sarcastic one and Kriti, love of Alok and a good friend. These five spend their college life together. They share love, joy, drama, agony, horror everything. They always help each other no matter the situation is. Rohit and Aisha soon fall for each other. Their relationship is perfect. They complement each other. Rohit's life has completely changed because of Aisha. She brings the best out of him. There love story is sweet and simple. They all were happy until a tragedy hit their life. A tragic incident turns their world upside down. I am not gonna spoil the story by telling you about the traumatic incident. It was a turning point in the story and their lives as well. They all completed their graduation. Rohit and Aisha dreamed of their marriage; Alok, Neha, and Kriti were looking forward to their post-graduation. They all were excited for Aisha and Rohit. Their love was strong, and it had left a positive influence on everyone's life. We all have regrets in our life. We have dark sides as well. But we don't show that often. It only comes out when we lost something very dear to us or when someone cheats us, leaves us alone forever. Some people forget and forgive, but some seek for revenge. This story is a perfect blend of love and seeking revenge. Sometimes your emotions cloud your judgment, and you no longer are the same person as you were once. The author describes their friendship and love life in detail. I can connect with the characters. I felt their joy and pain. The writing is flawless. The story is engaging and didn't bore me. It shows the reality of our society; a harsh one. The author tries to bring a change in the community through this story. This book gives you a sad ending and leaves the reader with so many questions and pain. The author creates suspense element very well. This story touches my soul and makes me cry. The narration is powerful. The author narrates Aisha's relationship with her parents well. The story is described by Alok's point of view. The characters grow with the story. But I expect more from Neha and Kriti's character. The story keeps readers hooked. The language is simple. At some points, it feels cliche. I love reading the letter written by Aisha to Rohit. Circumstances change a good person into a monster. There is a lot more about this story rather than love. All the happy moment they shared with each other will live with you even after the story ends. I would strongly recommend this book to everyone. "To Love with Love." composition too, I tried to write all that I feel. But nothing beats these simple three words: I love you!" Aisha and Rohit are like chalk and cheese. While Rohit is completely aimless, and imperfect, Aisha is focussed and a perfectionist. Just two opposites. But don't they say opposites attract? He loves her...She loves him. Their wedding is on the cards but their love is put to the test when an unforeseen incident hits their lives. Can loving somebody immensely set you apart? Can everything just change in the blink of an eye? Aditya Nighhot is pursuing his MBBS degree from a renowned college in Pune. He is a professional photographer, an avid reader, and fond of music. As a twenty-year-old student, he feels that he can connect to the emotions of the youth and express this through his books. With social messages being the crux of his books, his writing has proved to be a boon to his audience; as a result, he has been interviewed by various radio stations. Aditya's debut novel U n me...It's complicated!!! was originally written as a hobby with limited copies printed for friends, family, and a few readers. But the positive reviews he received encouraged him to write another novel. His book Until love sets us apart, previously titled In the blink of an eye, won the "Best Romance Book of the Year" award and has inspired him to write more. He is currently working on his next novel.